Who says your earrings have gotta match? Get this super-cool set of studs for $10 off with the code PEACEOFFERING. 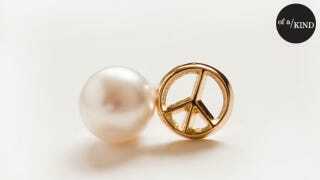 A classic white pearl...paired with a gold peace sign. Yah, it's a curveball—in a really good way. Anna Sheffield of Bing Bang is all about jewelry that's not too girly or precious. She knows how to take something classic and make it look fresh and a little badass. She makes the sort of things that can hang with torn jeans. Looking to score these earrings right this minute? Well, here you go: Get them for $58 with the code PEACEOFFERING. You can use that code PEACEOFFERING for any ol' thing you want to buy from Of a Kind between now and February 8, in fact.